Ovid’s poetry, once regarded as superficial in comparison to that of other Augustan poets, is now hailed for its artistry, its mastery at storytelling, and the profound influence it has had on literature and art from the poet’s own time to the present day. 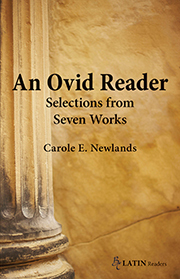 This Reader’s commentary gives grammatical and syntactical assistance, seasoned with appreciation of the fine points of Ovid’s complex literary style. Latin selections are drawn in part from his elegiac poems and demonstrate the new range of directions for elegy developed by Ovid: not merely love elegy (Amores, and with a fresh epistolary form in Heroides); but also didactic and aetiological elegy (Ars Amatoria, Fasti), each with a twist on expected subject-matter; and exile poetry (Tristia, Epistulae ex Ponto), whose elegiac themes are adapted from earlier poetry to express emotional as well as political meaning after Ovid’s banishment from his beloved Rome. Select passages from the epic Metamorphoses, a brilliant experiment that uses a variety of genres under a unifying theme, fill out the collection with the work acknowledged to be Ovid’s major achievement.